Papua New Guinea's Jonathan Allen gets a toe to the ball as a Tongan player watches on. 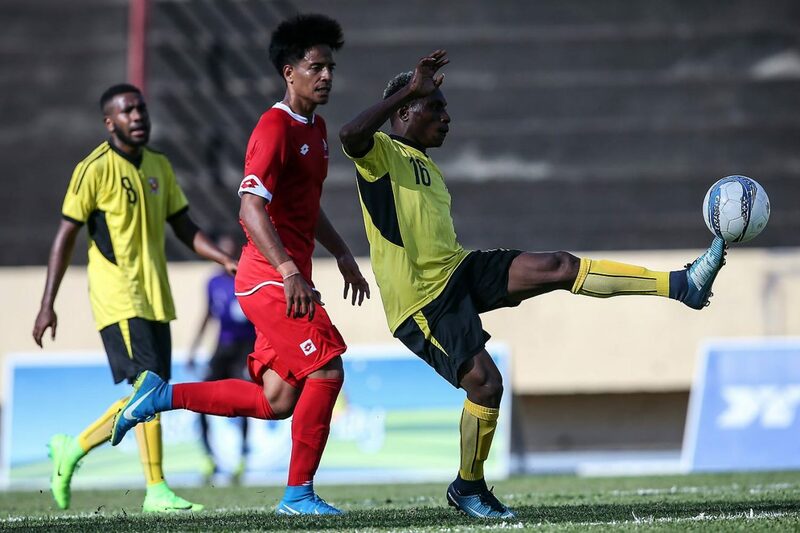 Papua New Guinea have opened their OFC U-19 Championship campaign with a strong start and among the star performers in the 4-0 win over Tonga were brothers Jonathan and Abraham Allen. Originally from the beautiful Madang province, Jonathan and Abraham grew up in a family devoted to football. Their father is a coach at the Madang football club in the semi-professional PNG National Soccer League (NSL). Madang is a province known for producing some of PNG’s top footballers including the Komolong brothers, Alwin and Felix and former Lae City Dwellers striker Raymond Gunemba. The province is the most football-obsessed region in the Melanesian nation. Both brothers started playing from an early age in the lower division up to the elite level of football in PNG. “Our father is the one who put us into a club in Madang province. We started playing in C division we were then promoted to the B division and after that we went to the top league in Madang,” Abraham said. This is not their first trip to French Polynesia, with the pair also involved in the OFC U-17 Championship. “We were just unlucky to lose 2-1 against New Zealand in the semi-final,” Abraham said of last February’s ill-fated campaign. “This year we need to work harder to make it into the semi-finals again because our group is very tough,” he added. Both Jonathan and Abraham played in the lone striker’s role for their country against Tonga, with the younger Abraham coming on as a substitute for his brother in the 60th minute. After Jonathan scored the second of Papua New Guinea’s four goals but his brother did one better when he notched a brace during his 20 minute cameo. “I felt really good after scoring two goals in the second half of the game against Tonga. “I was on bench watching my brother missing his chances, so I was thinking that when I go in, I need to score and I did it,” he said. Abraham stated, as blood brothers, it’s always special playing alongside each. “We’re happy that both of us are travelling with the team as blood brothers,” he said. Jonathan insisted he will need to improve his finishing, after missing so many chances in the first game, if he wants to avoid having Abraham continue to one-up him. “I think we had a good game against Tonga especially up front. We created a lot of scoring opportunities,” he said. With three points already in the bag, PNG are heading into their second game against Tahiti knowing another win would put them in a good position for progressing to the semi-finals. “The second game against Tahiti will be hard because they are bigger in size than us, but we will try our best and who knows maybe one of us will score again,” Jonathan remarked.